La Pulente platform looking north along St. Ouën's Bay. These are relatively level areas of rock which fringe coastlines and extend variable distances offshore. They are often backed by cliffs and have been formed by wave erosion (hydraulic action and abrasion) of the cliffs, causing cliff recession. A wave-cut notch or groove is formed at the base of the cliffs and when the overhang becomes too great, the cliffs collapse and so retreat inland leaving a platform which represents the remnants of the former land area. Remnant high points vary from outlying islands, to stacks and reefs. 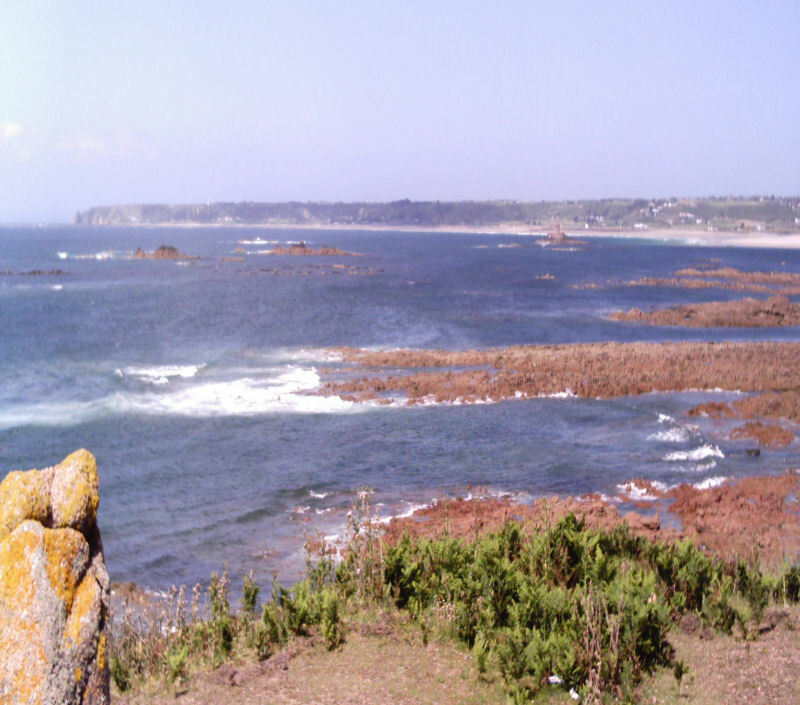 In Jersey, they occur off the northwest coast, west of L' Étacq; off the southwest coast from La Corbière to La Pulente, and off the south coast from St. Helier eastwards to Seymour Tower, southeast of La Rocque Point and partly northwards. Their full extent is revealed twice per month at low spring tides. Although their full extent and geology are then clearly exposed (despite some seaweed), these are the most dangerous tides to explore them and great care must be taken. The tidal range is 12 - 13m and these tides flood very quickly, especially along the gullies rising half their range in the middle two hours. The Admiralty Leisure Folio series 5th. Ed. 2006, available at Yacht Chandlers in St. Helier contains excellent maps of the coastal platforms, eg. Jersey 5604.13. L'Étacq platform (above) extends for a c.1 mile offshore westwards to the Rigdon Bank, of shallower depth than elsewhere seawards and is composed of rocks of the Jersey Shale Formation. There are few reefs or stacks but the various lithologies, structural attitude of the beds, the plunging folds, and the fault lines are well exposed, the latter as gullies varying in width and depth, the most prominent being that of La Bouque Fault. It extends southwards just beyond La Saline slipway before being covered by the present sandy beaches but reappears from La Rocco Tower southwards as La Pulente platform (see top photo). From just north of La Pulente southwards around to La Corbiére it comprises the eroded Southwest Igneous Complex coarse granite intruded by dolerite and aplite dykes. Low stacks occur on the platform just to the north in St. Ouën's Bay, the most visible (actually on Jersey Shale Formation rocks) having been used to site La Rocco Jersey Round Tower. At the southern end, a prominent, classically jointed granite stack has been used as the site for La Corbière Lighthouse. Along the south coast from La Corbière eastwards, there are isolated reefs, with one group, the Sillettes south of Noirmont Point, being exposed at low spring tides but the next main platform extends south and east of St. Helier and consists of the eroded granites and diorites of the Southeast Igneous Complex, intruded by the many dolerite dykes of the Main Jersey Dyke Swarm and with one mass (exotic?) of the Rozel Conglomerate Formation. The former cliff line can easily be seen as the high hinterland area sloping down to the present day narrow coastal plain. 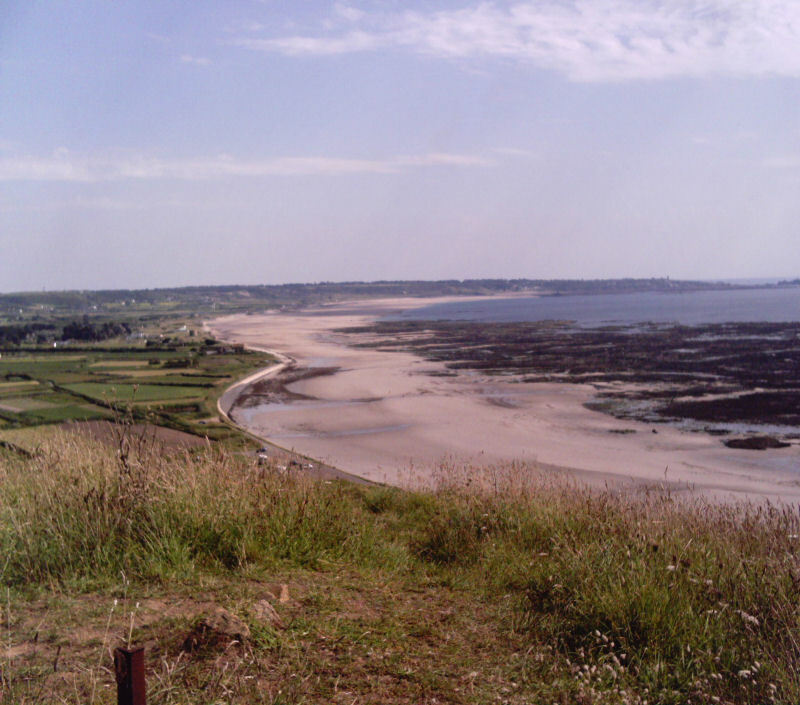 East of the outlier of L' Islet on which Elizabeth Castle and the Hermitage stand, the platform comprises low reefs cut by many gullies, locally called gutters, extending c. 2km south and fringing the coast around the southeast corner at La Rocque and into the Royal Bay of Grouville. Erosion has left several stacks, prominent ones having been used to build the navigation tower, Le Demi des Pas, Icho Tower (a defensive Jersey Round Tower), and Seymour Tower, a square defensive tower, c. 2.5km southeast of La Rocque Point. The prominent stacks have Jèrriais names which indicate a feature or a hazard and are best illustrated on the nautical charts for Jersey. Note that here too, it is dangerous to explore the platform at low spring tides as the flood tides advance and rise very fast along the deep gullies and it is easy to become isolated and cut off from the shore. Sea mists can also occur rapidly, obscuring the shore, and causing disorientation. The Seymour Tower area of this platform forms part of the shallowest area between Jersey and Normandy; it includes the offshore reefs of La Chaussée des Boeufs which are thought to have formed part of a land bridge, the last remaining area between Jersey and the lower Cotentin Peninsula to have been covered by the rising sea levels, c. 5000 years ago. 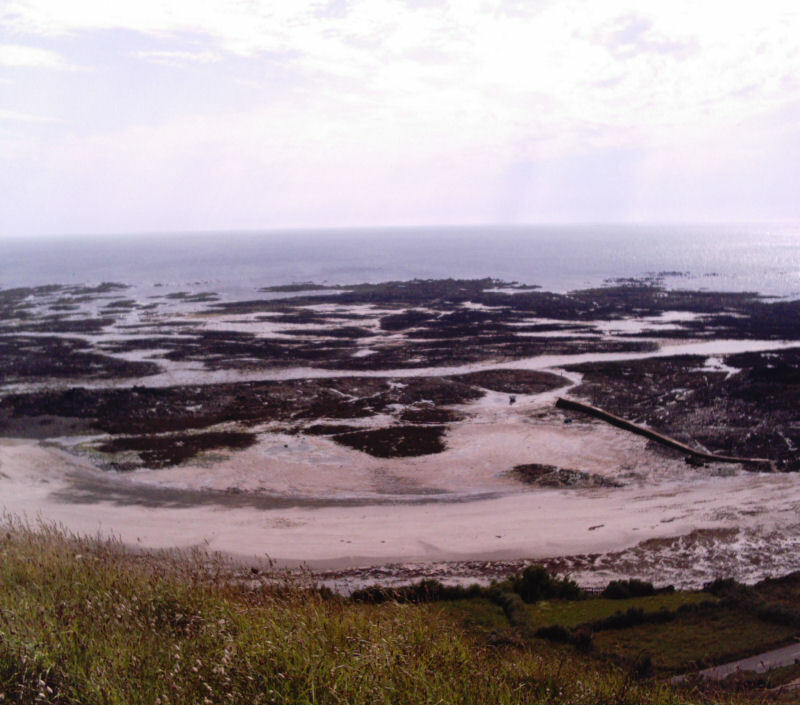 Further north, from Gorey to St. Catherine, there are areas of offshore rocks of the Jersey Volcanic Group and the Rozel Conglomerate Formation exposed at low water but they do not form an extensive platform. Admiralty Charts, 2006. St. Malo to Jersey, 5604.5 and Jersey, 5604.13. Admiralty Leisure Folio, The Channel Islands. 5th. Ed.